It may seem like an unusual topic to discuss, but ear fungus is a real issue for many people, particularly those in tropical regions. Known as otomycosis, this infection may present pain, redness, itchiness, and, in some cases, loss of hearing. It is commonly associated with swimming holes and pools as well as poor hygiene. 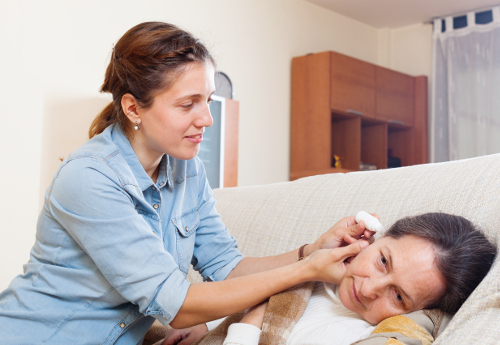 As it is treatable, we will look at otomycosis symptoms to watch for and discuss home remedies for ear fungus treatment. What Is Ear Fungus (Otomycosis)? As the name implies, an ear fungus is a fungal infection of the outer ear. In addition to otomycosis, this condition is also referred to as Singapore ear, mycotic otitis externa, and fungal ear infection. With the initial symptoms, an ear fungus infection is sometimes mistaken for a bacterial infection. It is usually correctly diagnosed once the prescribed antibiotics fail to treat the condition. What Causes Ear Fungus (Otomycosis)? Two common causes of ear fungal infection are contaminated water and continued use of antibacterial topical products. The fungus in ear can be linked to the different fungi in our environment, with the most common being Aspergillus. Other sources are Candida, Actinomyces, Phycomycetes, and Rhizopus. Although these fungi are widely present, they do not affect everyone. Those most at risk have low-functioning immune systems. This is one of the reasons why diabetic patients need to control blood sugar levels at all times because they are at a higher risk of infection. Most experts agree that the first step of medical treatment for ear fungus is to have the ear meticulously cleansed. This is usually performed by an ear, nose, and throat specialist over two to three weeks, to ensure a thorough cleaning and drying of the ear is complete before applying ear drops to treat the infection. The antifungal drops used to destroy the source of the infection are administered over seven to 10 days. This may be extended over several weeks depending on the type and severity of the fungal infection. Treatment can be a smooth process for most patients. Those with diabetes, and the elderly, must take special care as the infection is easily spread from the external ear canal to the inner ear. From here, the fungal infection may continue and affect the base of the skull on the other side of the inner ear. This would require hospitalization with specialized treatment. As with the medical treatment, otomycosis treatment at home requires delicate cleaning of the ear to remove any forming crust before application of ear drops, including homemade solutions. Please consult with your primary care doctor before trying any of the following home remedies. The use of hydrogen peroxide may soften the collection of hard crust created by the infection on ear. It is important to remove such particles to allow ear drops to reach the fungus source. We know that fungi thrive in moist areas; therefore, it is crucial to ensure the ear and ear canal is dry at all times. To dry, use a hair dryer instead of cotton swabs, as further damage to the ear may occur and promote fungal infections. Combine equal amounts of vinegar and alcohol to create a solution to treat the ear fungal infection and alleviate symptoms. The vinegar works as an antifungal stimulant in treating and preventing further growth. The alcohol will quickly dry the area as well as work as a disinfectant. Ear fungus can be as disgusting to deal with as it sounds. An infection of the ear caused by a number of fungi, this condition presents varying degrees of pain and discolored discharge from the affected ear. It is mainly found in warm, tropical climates, and can be indirectly spread by poor hygiene and swimming pools. It is treatable and there are home remedies that may mimic medical treatments in efficacy. “What is Otomycosis or Ear Fungus? Know Its Causes, Symptoms, Treatment, and Home Remedies,” ePain Assist; https://www.epainassist.com/earache-or-ear-pain/what-is-ear-fungus-or-otomycosis-or-singapore-ear-know-its-causes-symptoms-treatment-and-home-remedies, last accessed April 24, 2017. “Fungal Ear Infections,” Hidden Hearing; http://www.hiddenhearing.co.uk/hearing-problems/fungal-ear-infection/, last accessed April 24, 2017. Mehta, V., “Ear Fungus Treatments,” Live Strong, September 17, 2011; http://www.livestrong.com/article/94086-ear-fungus-treatments/, last accessed April 24, 2017.